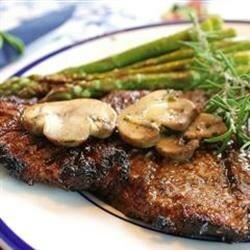 "Marinated steaks so tender you can cut with a fork! Friends and family always come running when they know I'm grilling." This was good. I would reccomend halfing the salt and adding two tablespoons of brown sugar, whaich would make this recipe a true five star.